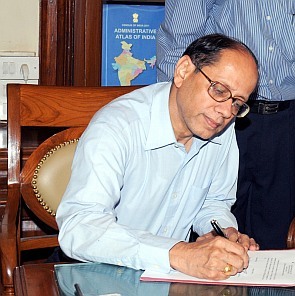 Cabinet Secretary Ajit Seth, who is due to retire on June 14, was on Monday given a six-month extension in service, the second time he has got it in the top bureaucratic post. The extension of Seth, 62, was approved by Appointments Committee of the Cabinet headed by Prime Minister Narendra Modi. The government has approved extension of Seth as Cabinet Secretary for a period of six months with effect from June 14 or till further orders, whichever is earlier, an official notification said. Seth, a 1974-batch IAS officer of Uttar Pradesh cadre, had taken over as Cabinet Secretary on June 14, 2011 with a fixed tenure upto June 14, 2013. The UPA government had extended his tenure by a year. Born on November 24, 1951, Seth is known to be a meticulous bureaucrat. Seth, who is 30th Cabinet Secretary, has served in various key positions in Uttar Pradesh government and at the Centre. Seth had been Secretary (Coordination) in the Cabinet Secretariat since January 2009. He did his Bachelor of Science and Master of Science in Chemistry from Delhi's St. Stephen's College and also Master of Philosophy in Life Sciences from the JawaharlalNehruUniversity. Seth subsequently also obtained a Master's degree in Development Finance from the University of Birmingham. For five years (1994-99), he was Joint Secretary in the Ministry of Textiles. In the 1980s, Seth had served in the Ministry of Commerce and he was posted as First Secretary in the Permanent Mission of India to the United Nations at Geneva, Switzerland, for there years--August 1, 1984 to December 1, 1987.